Want to know a weather secret? September is Seattle’s best summer month. A common observation around here is that summer never really starts in Seattle until after the Fourth of July. June will tease us with a few nice days but as soon as school lets out the sun plays hooky and the clouds and cool temperatures perform an encore for a few weeks. By the same token our summer weather, once it does arrive, is slow to go away, lasting comfortably into late September. There’s actually some scientific basis for the season’s tardy arrival and lingering afterglow. As a Seattle broadcast meteorologist I have made a career out of watching Pacific Northwest weather, which is sort of like watching water boil; change happens slowly, making our summers late bloomers. A kettle of water doesn’t come to a boil as soon as it’s placed on a hot stove, nor does the warm weather come to Seattle overnight. At our northern latitude the shift to summer is gradual with a capital “G”. Air masses take time to warm and skies to clear. Our moderate marine climate is dictated largely by our proximity to the Pacific Ocean. The slow seasonal temperature fluctuation of the world’s largest body of water has a strong influence over our weather, softening the rough edges of our forecasts. It’s the reason Seattle doesn’t get too cold in the winter nor too hot in the summer. While change happens slowly, when it does, the results stick with us, allowing the summer to simmer long long after Labor Day. Seattle’s average high temperature in September is 70, with overnight lows rarely dropping below 50. And it is Seattle’s third driest month with only nine days of rain most years. Of course anyone who has spent any length of time in the Northwest knows there are exceptions to any weather rule. September after all is a transition month where mild days are contrasted with cooler nights as fall nears. That can trigger more early morning fog, especially if there has been recent rain. And full disclosure here; the Northwest is arguably one of the toughest places to make accurate forecasts. The nearby ocean, lakes and two mountain ranges either side of us all steer weather patterns in ways that can stump even the most experienced meteorologist. Couple that with a scarcity of observation stations to the west in the Pacific where our weather most often originates and you can see why we occasionally get surprised. But all in all I standby Seattle’s Septembers as among the nicest anywhere. If you can take advantage of time off during the ninth month in our city you’ll still enjoy our summer charm, minus some of the crowds that can only visit in July and August. After Labor Day soak up Seattle while the rest of us go back to work or school. 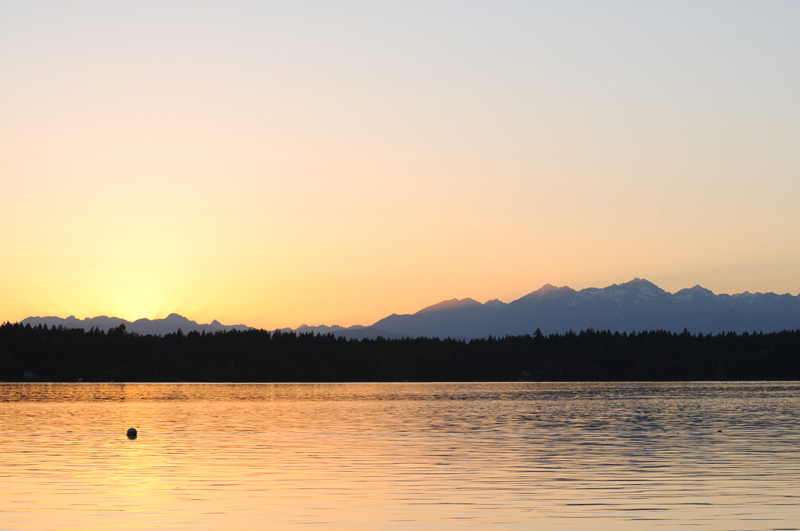 Sure the days are shorter, but that means you don’t have to wait as long to see those spectacular late summer sunsets sinking below the majestic Olympic mountains. Rick Van Cise is a nearly lifelong resident of the great Northwest and anchors news and weather for KOMO Newsradio and TV in Seattle.